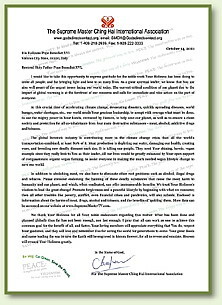 Out of Her deep concern for the fate of humanity, Supreme Master Ching Hai sent personal letters to world political leaders (please refer to Magazine #205 for details) and religious leaders to inform them of the current urgent state of global warming and to call on their "open support of compassionate organic vegan farming, to assist everyone in making the much needed vegan lifestyle change to save our world." 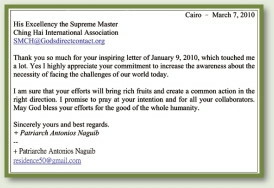 Thank you so much for your inspiring letter of January 9, 2010, which touched me a lot. Yes, I highly appreciate your commitment to increase awareness about the necessity of facing the challenges of our world today. I am sure that your efforts will bring rich fruits and create a common action in the right direction. I promise to pray for your intention and for all your collaborators. May God bless your efforts for the good of the whole of humanity. . . [W]e think that it is urgent to build a harmonious relationship between economics and the respect for natural resources, humbly accepting the limitations of environmental balance. It never hurts to remember that man is not the only one on the planet. Animals, plants, natural resources and minerals are an essential part of life and also have rights. 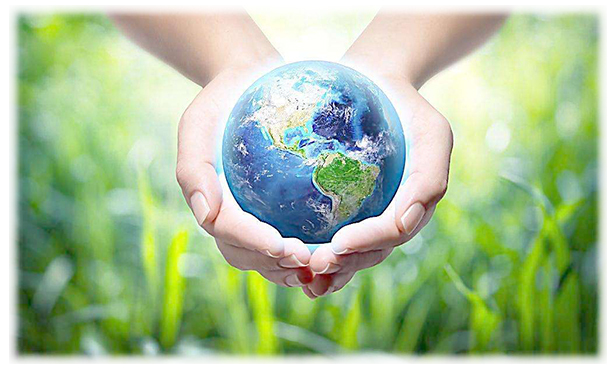 The Earth must be treated well and with consideration, because it is a live and dynamic organism. If we treat the Earth badly, we shall reap a harvest of evil and the Earth will turn against us. The Earth must not be hurt (Apoc. 11:18), or make her scream with labor pains (Rom. 8:22). Citing further inspirational biblical verses, Bishop Valenzuela declared that conservation of nature is God's commandment and it's the obligation of the church to make it part of its mission. In addition, both the Head of Cabinet for the Grand Rabbi of France, Eliya Bernheim, and Bishop Jesús Esteban Catalá of Malaga, Spain acknowledged their receipt of Master's letter. Bishop Catalá expressed his gratitude for the information provided. 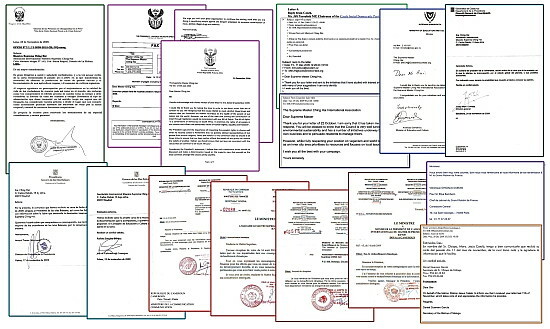 More letters from government leaders have been received from Hawaii, Peru, South Africa, Czech Republic, Mongolia, UK, Cyprus, Spain, Cameroon and Botswana. Many of them noted that they are seriously considering the issues that Master has brought to their attention. His Excellency President Seretse Khama Ian Khama of Botswana conveyed his appreciation for Master's positive and encouraging message, saying, "It is true that problems ravaging Africa can be solved by a spiritually enlightened citizenry." His Excellency President Elbegdorj Tsahia of Mongolia thanked Master for Her precious point of view and valuable suggestions for saving our planet, as well as for democracy, human rights, liberty and a humanitarian society. He expressed his determination to strive and to collaborate with all available resources to eliminate root problems such as meat, alcohol, illegal drugs and tobacco, which indeed cause the most harm to humanity and our planet. The Honorable Lieutenant Governor James Aiona of Hawaii thanked Master for promoting health and wellbeing. He explained that his office has been disseminating the same message through the "Healthy Hawaii Initiatives," which advocate proper diet and refraining from the use of tobacco and alcohol. 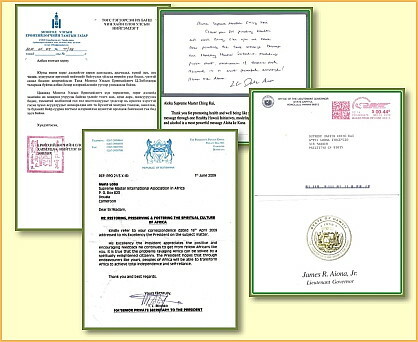 We are thankful for all the support given by religious and government leaders worldwide. May you continue to guide with wisdom, so that people choose the path of enlightenment, compassion, peace and happiness. I would like to take this opportunity to express gratitude for the noble work Your Holiness has been doing to unite all people, and for bringing light and love to so many lives. As a great spiritual leader, we know that You are also well aware of the urgent issues facing our world today. The current critical condition of our planet due to the impact of global warming is at the forefront of our concerns and calls for immediate and wise action on the part of everyone. At this crucial time of accelerating climate change, devastating disasters, quickly spreading diseases, world hunger, water shortages, etc., our world needs Your gracious leadership, to accept with courage what must be done, to use the mighty power in Your hands, entrusted by Heaven, to help save our planet, as well as to ensure a clean society and protection for all co-inhabitants from four main destructive substances - meat, alcohol, addictive drugs and tobacco. The global livestock industry is contributing more to the climate change crisis than all the world's transportation combined, at least 80% of it. Meat production is depleting our water, damaging our health, creating wars, and breeding new deadly diseases each day. It is killing our people. They need Your shining, heroic, vegan example since they really look to You as their leader. All our lives would be greatly enhanced by Your open support of compassionate organic vegan farming, to assist everyone in making the much needed vegan lifestyle change to save our world. In addition to abolishing meat, we also have to eliminate other root problems such as alcohol, illegal drugs and tobacco. Please consider endorsing the banning of these deadly substances that cause the most harm to humanity and our planet; and which, when eradicated, can offer immeasurable benefits. We trust Your Holiness's wisdom to lead the great change! Promote forgiveness and a peaceful lifestyle by beginning with what we consume; then all other troubles like poverty, conflict, even financial crises and pandemics, will also subside. 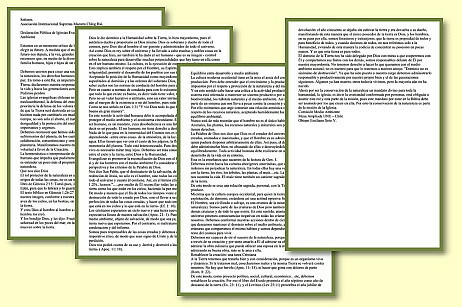 Enclosed is information about the harms of meat, drugs, alcohol and tobacco, and the benefits of 'quitting' them. More data can be accessed on our website at www.SupremeMasterTV.com. We thank Your Holiness for all Your noble endeavours regarding this matter. What has been done and planned globally thus far has not been enough, nor fast enough. I pray that all can work as one to achieve this common goal for the benefit of all, and faster. Your loving members will appreciate everything that You do, respect Your guidance, and they will love and remember You for saving the world for generations to come. Your great deeds and name leading the way to save the Earth will be engraved in history forever, for all to revere and emulate. Heaven will reward Your Holiness greatly.